Samsung's latest flagship Android smartphones are waterproof, well designed and have an interesting UI. But there are no unlocked versions in sight. The Samsung Galaxy S7 and S7 Edge are beautifully well-executed smartphones, worthy flagships from one of the world's largest electronics manufacturers. The changes from last year's S6 lines are incremental, but the fixes and upgrades are in all the right places. Those small improvements make for two vastly better phones, which start at $650 (for the S7) and $750 (for the S7 Edge), depending on the carrier. Samsung, like its bête noire Apple, seems to be on a two-year schedule, with major upgrades and model increments appearing in alternating years. The S7, like Apple's biennial "S" upgrades, builds on last year's models in important ways without changing the basic form. The signature improvement, the one that will headline many reviews, is true: The S7 line is all but waterproof. In tech terms, the S7 phones have an IP68 rating: Impervious to dust and protected from prolonged immersion of up to 3 meters. 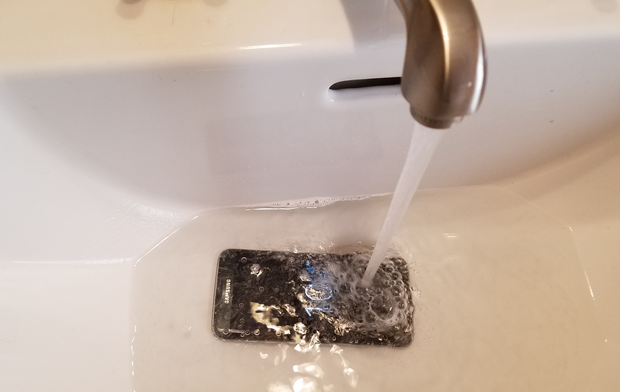 In 30 years of reviewing electronics, I've never before dunked a product. This past week, I filled a sink (it's still winter in New York and a pool wasn't handy) and dropped in a phone. On purpose. And left it there. It sank -- but it was fine. None of the obvious penetration points -- the micro-USB power port, mic, speaker, power and volume buttons, SIM/memory drawer -- leaked water. Over the past year (admittedly a bad year) this single feature would have saved my family $1,000. The Samsung Galaxy S7 is very water resistant. Really. A waterproof product, interesting as it may be, would be kind of pointless if that was the only remarkable thing about it. The S7s just start there. These are top-of-the-line phones. The S7 is 5.6 x 2.75 x 0.3 in. with a 5.1-in. screen; the S7 Edge is 5.9 x 2.9 x 0.3 in. with a 5.7-in. screen. The S7's screen is flat; the Edge version is rounded along both long edges. The S7 weighs 5.36 oz. ; the Edge weighs 5.54 oz., not a particularly noticeable difference. The phones themselves are sleek and welcoming; they felt well balanced in my hand. The screens of the S7 and S7 Edge will knock your eyes out. Both displays are Super AMOLED, protected by Corning Gorilla Glass 4, 2560 x 1440 pixels with a 640dpi resolution. They're astonishingly sharp, and the processing infrastructure behind them easily keeps up with the displays. The added real estate of the dot pitch and pixel count gives the interface room to breathe that you may not have known you were missing. The Samsung phones follow the current fashion of "always-on" screens; even when the phone is in sleep mode, it displays the time or calendar. (Exactly what the phone displays is configurable to a slight extent.) Samsung says power drain is minimal -- 0.8mAh per hour -- and has no significant impact on battery life. I'd agree with that claim. And as in previous models, the rounded screens of the S7 Edge have functions. Depending how and where you swipe from the edge, you can read news or sports headlines, get quick access to top contacts or frequently used functions. The Edge has a Do Not Disturb mode that shows the time only along one of its edges. It's really quite subtle and lovely. And swiping up and down along an edge when the phone is asleep will show you how many emails you have waiting and show a news crawl. I love the look and feel of the Edge -- and I'm not usually a fan of big phones -- and kept hoping to love the Edge-exclusive functions, but could never quite get there. They're an incremental interface improvement, but in and of themselves, not a reason to get the Edge. There's hardly a corner on these phones. The sides are rounded and fit comfortably in the hand. The power button is on the right edge, perfectly placed, and volume buttons are along the left edge. The SIM/SD card drawer is on the top; the speaker, micro-USB port and earphone jack are on the bottom. The power and volume switches are perfectly positioned under your thumb and index fingers. The designers paid close attention to the phone's balance and the way you'll hold it, and the buttons are exactly right in ways that most phones' aren't. Notice two of those features: Samsung has restored the micro-SD port that it took out of the S6, and it has decided to stick with a micro-USB power connection instead of USB-C. The former is a welcome choice. The wisdom of the latter will be revealed only with time and through the competitive landscape. The battery (3,000mAh for the S7, 3,600mAh for the Edge) remains sealed. This really isn't a problem; the phones support QuickCharge 2.0 and charge fully in about two hours. Rundown tests show a 4-hour talk time for the S7 and 5 hours for the Edge, and standby times of more than two days each. Both support wireless charging -- both the Qi and AirFuel standards -- which wasn't tested for this review. Depending on which market you wind up with, your phone may be based on either a Qualcomm Snapdragon 820 or Samsung's home-rolled Exynos 8890. (In the review units, both on Verizon for the U.S. market, the S7 came with a Samsung processor and the Edge with Qualcomm's.) Both are quad-core top-of-the-line processors, and if there is any functional difference between them, it didn't emerge in testing. Both phones have a slightly raised oblong Home button/fingerprint sensor in the center of the phones' front bottom edge. The Chooser and Back capacitor buttons are on the left and right, respectively, of the Home button, and light up only when they're touched. This is something of a UI problem because there's no indication that the buttons exist, let alone their function, until you use them. Unlike the Power and Volume controls, the bottom-row controls are just OK. I've become a fan of the way LG puts a fingerprint sensor/Home button on a phone's back, and the ability in LG phones to change the arrangement of the front panel buttons to account for handed-ness. Samsung's phones always have the Chooser on the left and Back on the right. The main camera on the back of the phones -- in the center laterally and about a half-inch from the phones' top edge -- cause a barely-there 0.5mm bump, significantly less prominent than in previous models. It's a 12MP camera that's been built with low-light shooting in mind. The camera's got an aperture of f/1.7 and fewer pixels on the same-size sensor as the S6, which lets the remaining pixels be larger. That's key for photo quality. An LED flash and heart rate/SpO2 sensor are to the right of the camera lens. The phones have the expected complement of Bluetooth, GPS, NFC and WiFi radios. They work with Samsung Pay and Google Pay, and they still puzzle sales clerks when Samsung Pay mimics magnetic card swipes. One of the places that Samsung has applied its processing power to is the camera. Focusing and exposure calculation is very fast. There are panorama, hyperlapse and slo-mo modes, as well as a Food mode if you're one of those annoying people who eat with their eyes. In addition, the S7s allow live streaming over YouTube. Selective focus lets you pick what part of an already-taken photo will be in focus, and there's a "virtual shot" mode that seems to be a kind of panorama mode around objects. I didn't understand it and couldn't get it to work in any interesting way. And, for ultimate control freaks, there's Pro mode that gives you full exposure control. The camera even lets you save in RAW format. TouchWiz is Samsung's Android UI, and it's gotten a refresh for Android 6.0. How annoying you find it will probably be a function of how much of an Android purist you are, or how much you've gotten used to other phone makers' versions of Android. As UIs go, though, there's a lot to recommend in TouchWiz. When you pull down from the top of the screen, you'll see the usual set of notifications, along with a horizontal row of well-chosen quick-access settings buttons: Wi-Fi, Location, Sound, Auto-rotate and Bluetooth. Pull down again, and rather than the usual full Settings menu, you're presented with four rows of customizable quick-access settings buttons. If you want something that isn't in that matrix, you can click on the gear, as usual, to forage through the Android settings list. (Left) Dragging from the screen edge of the S7 Edge brings up a set of quick-choice icons. (Right) The TouchWiz flavor of Android 6.0 puts the Google entry box a third of the way down the page and the Apps drawer at the bottom right. 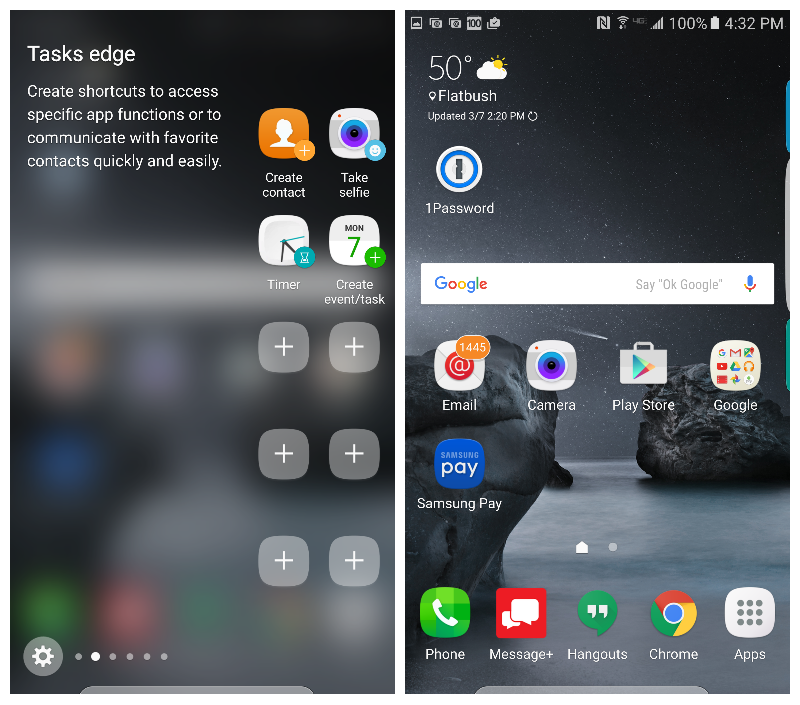 TouchWiz does a bunch of tricks to shrink the effective size of the screen for one-handed operation. On the Home screen, the Google entry window is a third of the way down the screen, rather than at the top. The Apps launcher is on the right of the lower row, rather than in the middle. Maybe the neatest trick, though, are the keyboards. Samsung has taken advantage of its high pixel count and resolution to shrink the keyboard in a way that doesn't force you to reach all the way across the screen to type with one hand. The keyboard stretches about three-fourths of the way across the screen (and includes a fifth numeric row), which makes it easy to type one-handedly. And best of all, you can choose which side of the phone the keyboard appears on, making life easier no matter which hand you type with. It is truly a beautiful hack. It takes a while to figure out that with TouchWiz, the Google Now interface isn't accessed by swiping right, the way it is in stock Android. Swiping right does nothing unless you've set up what appears to be an immovable Flipboard widget. If you want Google Now cards, tap in the Google search bar on the Home screen. The most annoying part of TouchWiz comes in the worst possible place: When you're setting up your phone. On a Verizon phone (our review units were on Verizon), there are no fewer than three ecosystems you need to opt into -- or not. First comes the My Verizon cloud, which wants to control your SMS, photos and contacts. Then there's Google, which is necessary because Android pretty much requires access to Google. Lastly, you're asked to create a Samsung account "to get the most out of your device," which seems to entail downloading Galaxy apps including S Health and unexplained "enhanced features." Three ecosystems is at least one too many, and leaves the nagging impression that the people who sold you the phone think of it less as a piece of personal technology and more as a network endpoint through which you can be sold services. That's not a particular rap against Samsung as much as it is about the wireless industry, except to the extent that the company was unable to build a graceful onboard experience that matches the elegance of their phones. As it is, the setup process is confusing and intimidating. You're being asked to opt into and create credentials for services you're not really told about; you're being asked three times for permission without being informed what you're signing up for. From a personal security standpoint, this is terrible. From a consumer point of view, it's pretty assaultive and underlines that the companies behind your phone see it as a way to, as they say, deepen their relationship with you. The services may well be useful, but this process isn't designed for informed consent. Pricing, unfortunately, seems to be carrier-dependent and get can very confusing to follow. For example, the Galaxy S7 with 32GB of storage costs $23 per month while the Edge, also with 32GB, costs $26 per month for 30 months from AT&T. You can also get the S7 for $200 or the S7 Edge for $300 with a two-year Verizon or Sprint contract via Best Buy. Willing to pay full cost? T-Mobile prices the S7 at $670 and the S7 Edge at $780; AT&T prices them at $695 and $795 with "qualifying service." There are a variety of other pricing options as well. And according to Samsung, there are no current plans to make the phones available unlocked -- an increasingly unusual state of affairs for high-end phones these days. 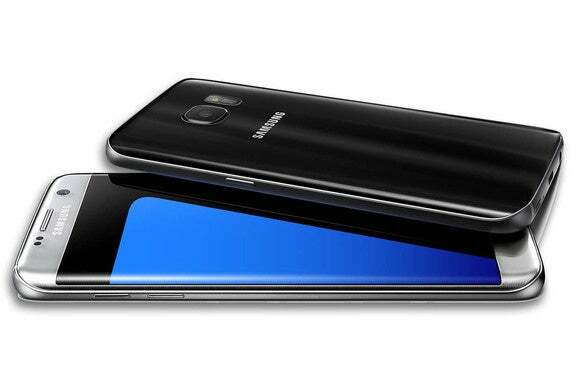 Over the past couple of years, Android phones have been gaining in power and sophistication, and the Samsung S7 series is pretty much the state of the art. The physical package is right: top-end build quality, waterproofing, switches in the right place, long battery life, expandability, a knock-out screen and plenty of processing power. The software is right: Smartly implemented UI enhancements and Android's increasingly seamless melding of device and cloud. There are quibbles -- placement of the fingerprint sensor, lack of handedness control of the basic controls - but they're just that: quibbles. Less of a quibble is a setup process that tries to lock you into ecosystems without your fully informed consent. But you can still say no and use the phone reasonably well until you know what it is you're consenting to. We're reaching the time of year when top-end phones are hitting the market. The Galaxy S7 and S7 Edge have set a very high bar for the rest of the industry. Whichever platform you may prefer, these phones are currently the ones to beat.